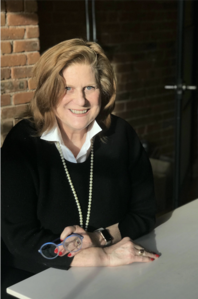 Carole Southall has been named Executive Director of Franklin Street Works, an award-winning contemporary art space in Stamford, CT. Former Director of Development at Westport Country Playhouse, Southall has 30 years of experience. At Westport Playhouse, the Wilton, CT resident cultivated a three-million dollar donation — the largest gift in the Playhouse’s history — which also served to launch its endowment fund. She was the frontline fundraiser responsible for 55 percent of the Playhouse's five million dollar budget. Prior to that, during her tenure with the National Parks, her passion project was leading the charge to raise the necessary funds for the Stonewall Inn to become an official National Park. Known for her creativity and strategic vision, Southall worked at several prestigious non-profits prior to the Playhouse, including the National Parks Conservation Association, UNICEF, and Lincoln Center Theater. In total, she has more than 30 years of development and cause-related marketing experience throughout the United States and Great Britain. She has been successful in major gifts fundraising, innovative cause-related marketing programs, and other entrepreneurial endeavors, including a 15-year stint as president of her own eponymous firm, which created high-concept cause-related programs for corporations and charities. Prior to her work in development Southall attended University of Washington in Seattle where, as an undergraduate, she studied printmaking with Jacob Lawrence and, later entered their Museum Studies Masters program. Carole Southall succeeds Bonnie Wattles, who helped Franklin Street Works achieve double digit audience growth, cultivate a strong and diverse base of funding, and significantly expand the role of the board during her tenure as Executive Director. Franklin Street Works would like to extend its deepest appreciation to the 2018 search committee: Sharon Chrust, Wendy Cooper, Beth Golub, Mark Nowotarski, Tom O’Connor, Abi Schultz, Bonnie Wattles. Franklin Street Works is an award-winning, not-for-profit contemporary art space whose mission is to manifest contemporary art in a professional and welcoming setting. Franklin Street Works aims to broaden community participation in the arts, contribute to a larger arts dialogue, and cultivate emerging artists. Since 2011, the organization has exhibited the work of more than 300 artists, curated 34 original exhibitions, and organized approximately 150 programs, including talks, tours, and performances. Their work has received national and regional support, including two multi-year grants from the Andy Warhol Foundation for the Visual Arts as well as regional grants from Fairfield County’s Community Foundation, Connecticut Office of the Arts, New Canaan Community Foundation, among others. Exhibitions have been recognized with positive reviews in major publications such as Artforum online, Art in America online, Art Papers, The Brooklyn Rail, Huffington Post, Hyperallergic, Art New England, Modern Painters and Two Coats of Paint.